The Squamish Days 8K Run is the 8th race in the Lifestages Lower Mainland Road Race Series. 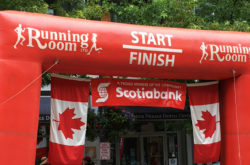 The series features nine of the best events in the Vancouver area, providing runners of all ages and abilities with the chance to compete against their peers. The Squamish Days 8K course is an accurately measured fast, flat, out-and-back route with a paved shoulder, minimal traffic and is friendly to wheelchair athletes. There is also a Stroller and Team Division. Post race includes draw prizes, awards and refreshments. Shower facilities available.